Natural Selection and Tropical Nature: Essays on Descriptive and Theoretical Biology. London: Macmillan and Co, 1891. Early printing of Wallace’s important contribution to evolutionary biology. Octavo, original cloth, gilt titles to the spine. In good condition. English naturalist and biologist Alfred Russel Wallace was one of the two leading figures in the development of the theory of evolution through natural selection alongside Charles Darwin. Darwin and Wallace’s theories differed slightly. Darwin argued that competition between members of the same species led to adaptation, while Wallace asserted that environmental pressures led populations of various locations to diverge. 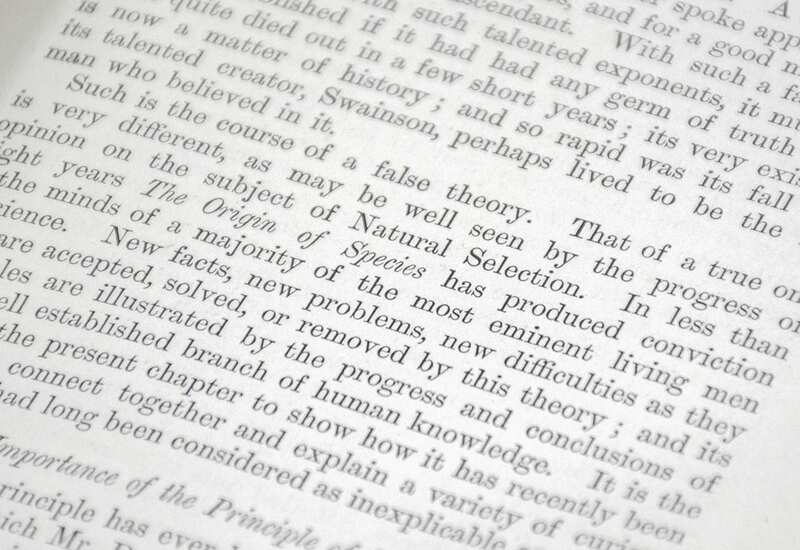 In 1858, Darwin and Wallace published a joint publication: On the Tendency of Species to form Varieties; and on the Perpetuation of Varieties and Species by Natural Means of Selection, the content of which Darwin would develop into his magnum opus, On the Origin of Species, published the following year. The essays included in the present volume deal primarily with natural selection as applied to tropical vegetation and animal life. Island Life or the Phenomena and Causes of Insular Faunas and Floras Including a Revision and Attempted Solution of the Problem of Geological Climates. London: Macmillan and Co, 1892. Second and revised edition of Wallace’s work on the geographic distribution of animals. Octavo, original cloth, gilt titles to the spine, frontispiece map showing the distribution of jays with tissue guard, illustrated with various maps and charts. In very good condition. A nice example of this important contribution to evolutionary biology. 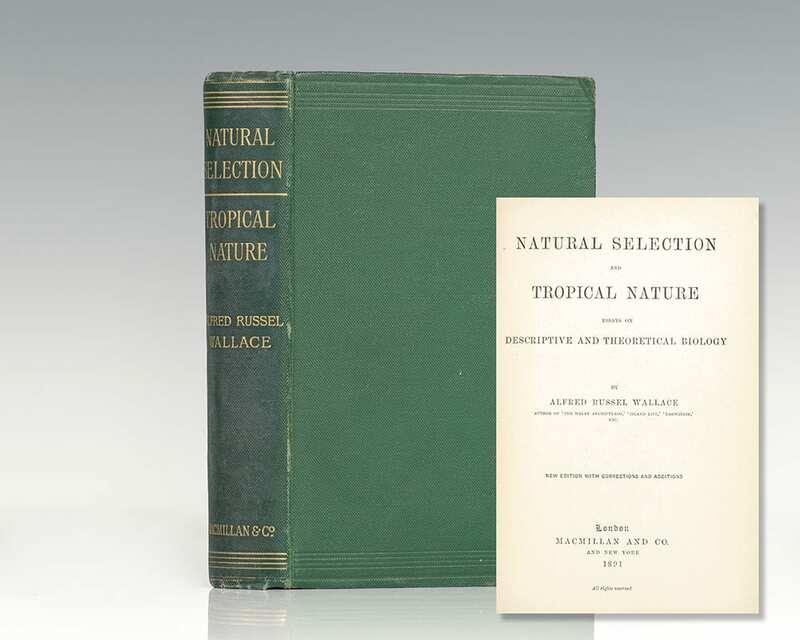 The Works of Alfred Russel Wallace Including: The Geographical Distribution of Animals, Contributions to the Theory of Natural Selection, Tropical Nature, Island Life, and Darwinism: An Exposition of the Theory of Natural Selection. London: Various publishers , 1871-1910. First editions of the works of English naturalist Alfred Russel Wallace including a presentation copy, inscribed by the author. Octavos, 16 volumes, uniformly bound in three quarters morocco by Root & Son, gilt titles and tooling to the spine, raised gilt bands, top edge gilt, illustrated, folding maps to many volumes. 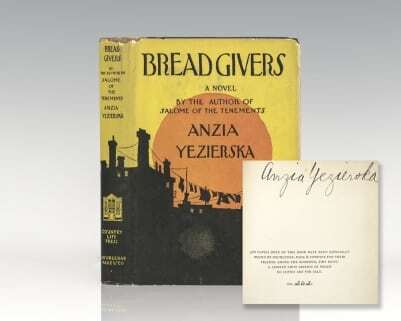 Land Nationalisation, its Necessity and its Aims is a presentation copy, inscribed by the author on the verso of the front free endpaper, “From the author.” First editions with the exception of Contributions to the Theory of Natural Selection, The Wonderful Century, and Man’s Place in the Universe. In near fine condition with light rubbing to the extremities. Rare and desirable. Tropical Nature and Other Essays. London: Macmillan and Co, 1878. 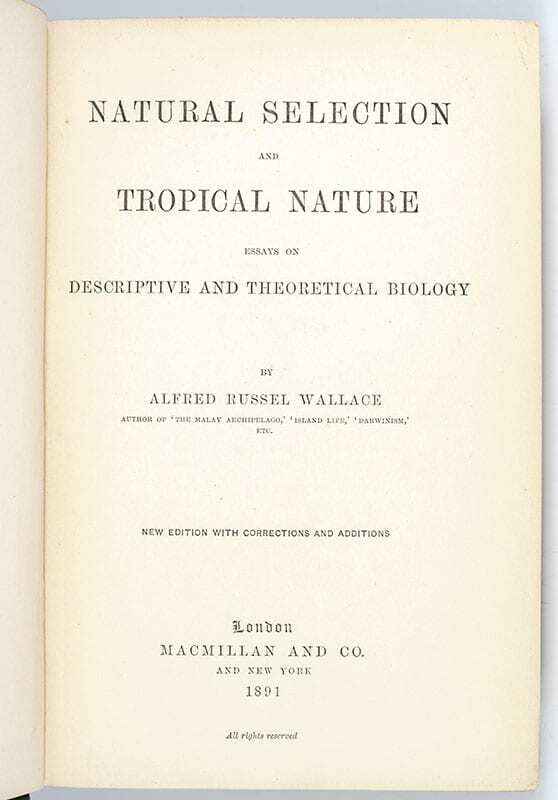 First edition of English naturalist and explorer Alfred Russel Wallace’s collected essays on tropical ecology. Octavo, original cloth, gilt titles and tooling to the spine. In good condition. 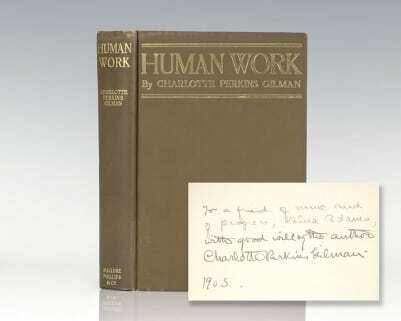 From Guille-Alles Library, Guernsey with the original library labels to the spine and front panel, folding lending card affixed to the front pastedown, library stamps. Contributions to the Theory of Natural Selection. 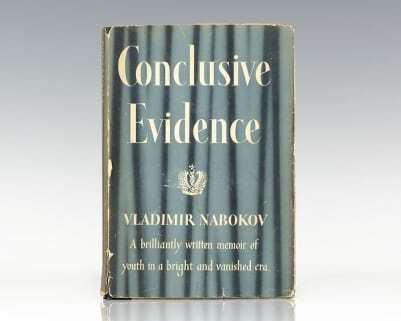 A Series of Essays. First edition of Wallace’s collected essays on the theory of natural selection. Octavo, original cloth, gilt titles to the spine. In very good condition. Rare and desirable. Darwinism: An Exposition of the Theory of Natural Selection with Some of its Applications. London: Macmillan and Co, 1889. First edition of Wallace’s assessment of Darwin’s Origin of Species. Octavo, original cloth. Frontispiece portrait of Wallace with tissue guard, illustrated, folding map of The World on Mercator’s Projection in three colors. In good condition.